Bringing One Sleepy Night to life has been a great adventure. 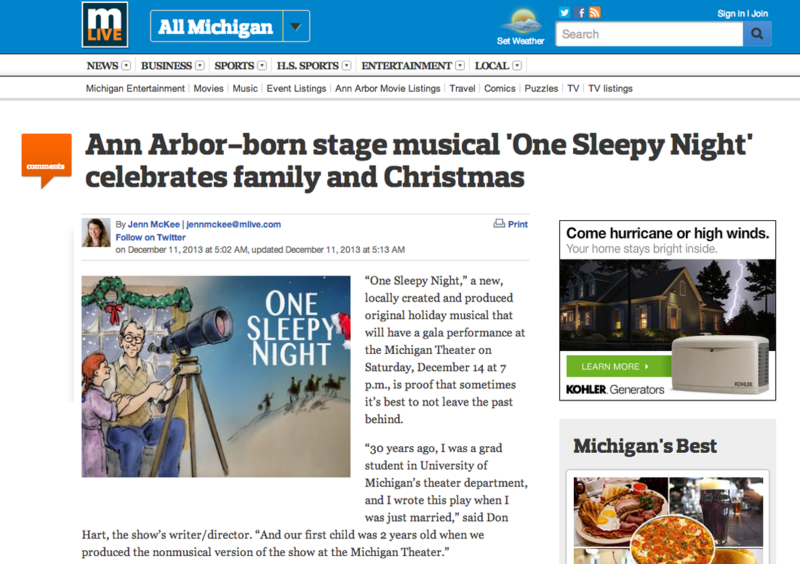 It started some thirty-two years ago when I wrote the non-musical version of the show, and with a stellar team, produced it at the Michigan Theater. The show went to sleep, so to speak, until about ten years ago when I was inspired to do a musical version. I started plunking out the notes and the melodies for the songs emerged. Four years ago, I got together with Ann Fons who helped me bring more structure to these melodies. Then, in February of 2013, I shared the work with Jay Sappington. 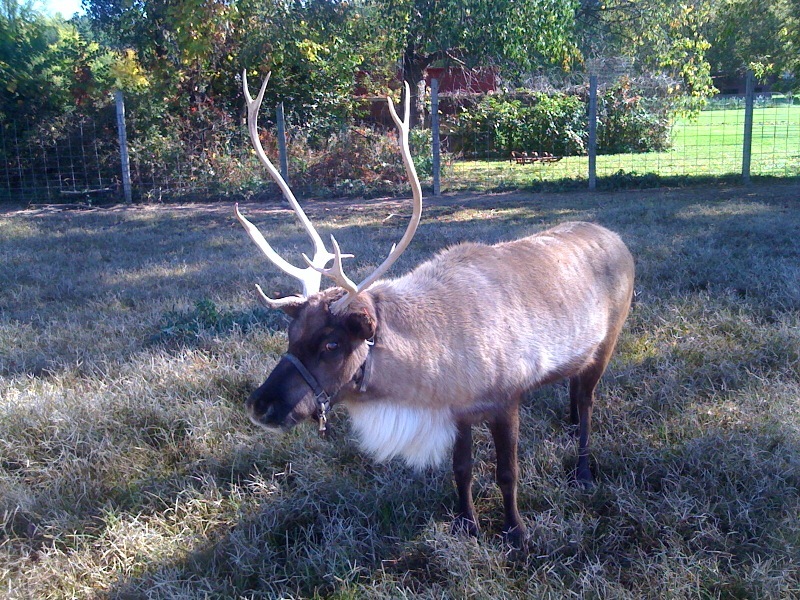 He was excited about the music and agreed to be my co-composer. Jay's expert skill as a composer and lyricist helped us take a giant leap forward. Then Daniele Siliquini, in collaboration with Jay, added his beautiful touch to complete the arrangement and orchestration. ​Along the way, we completed a Kickstarter campaign as the first step in funding the show. Over 75 supporters backed our efforts and we took that as the go-ahead to present the show in December of 2013. A wonderful cast and orchestra--I wish you could get to know each one of them personally because they're all awesome--rehearsed and brought the show to life both at an ​intimate venue, Ann Street Music Room and the large stage at Michigan Theater. One Sleepy Night is the story of how retired Grandpa Benny Wilson, struggling with life and his marriage, tells his granddaughter Suzy, the real story of Christmas and reawakens the family to hope and love. Through the magic of Grandpa's telescope, the ancient story comes to life and the characters in the modern setting become characters in the ancient story. Grandpa becomes Kaspar, the head wise man. Grandma becomes Mrs. K, his wife. Suzy becomes the Boss Shepherd (who now gets to boss her three older brothers!). All roads lead to a stable where Deborah, Mrs. K's servant, lets everyone gathered there know that "You've Got the Gift." All of us--cast, orchestra, crew and sponsors--were so delighted to have an audience arrive--especially at the performance at the MIchigan Theater when we had the biggest snowstorm of the year (over a foot of snow in four hours). Our goal is to create a wonder-filled experience where our audience discovers the gift of love that came late One Sleepy Night. From what we heard, that's what happened and so we've decided to develop the show further and bring it to towns and cities across America. What you'll read below are some of the milestones on the journey so far. We'll keep you up to date on how things develop as we journey forward. We hope you'll join us. We hit our Kickstarter Goal!!! bringing this wonderful musical to life! W4 Country interview with Bubba. Daniele and Don outside the Michigan Theater. With every ticket purchased for the 2013 performances, we donated part of the ticket price to two organizations serving kids. Locally to The St. Louis Center in Chelsea, Michigan, ​and internationally to the work of Bethania Kids in India. 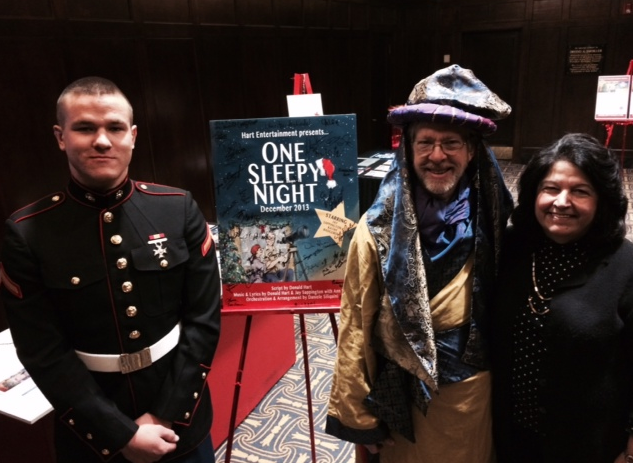 A wonderful crowd had a great time seeing One Sleepy Night on the big screen! 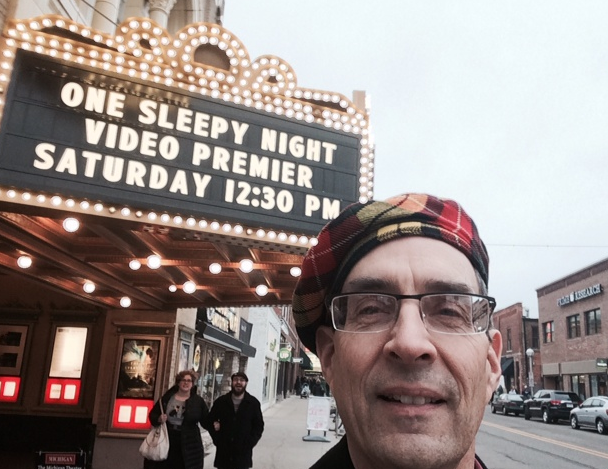 This December 13, 2014 at 12:30 p.m. at the Michigan Theater Screening Room on 603 E. Liberty in Ann Arbor, we featured the premier of One Sleepy Night, the video--as recorded at the December 2013 Gala Performance. The audience enjoyed the show and supported us. By contributing they became part of a committed team that will help us accomplish our vision of taking One Sleepy Night to towns and cities across America. With enough support we hope to take the show on the road in 2015, performing it live in towns and cities around Michigan. To make a contribution or for more information call 734.973.6010. As part of our Video Premier Screening, we partnered with Toys For Tots. Audience members gave Christmas toys to needy kids in Washtenaw County. They brought their toy to the matinee at 12:30 p.m. at the Michigan Theater Screening Room. 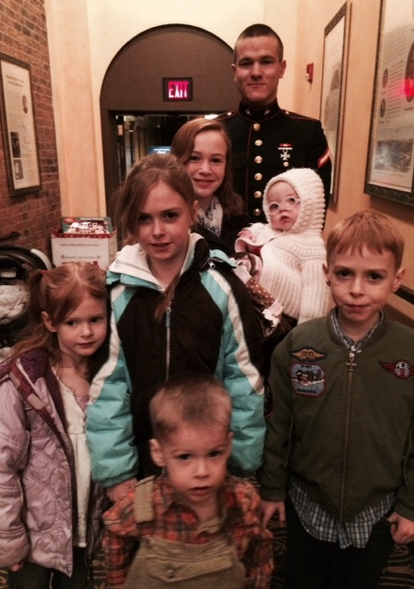 What was really special is that Marine Mike came to lead us in collecting the Toys for Tots toys. He truly exemplified the Marine values of honor, courage and commitment. And some of us got a picture with our very own Toys for Tots Marine! ﻿To discover how you can be of support, click below.